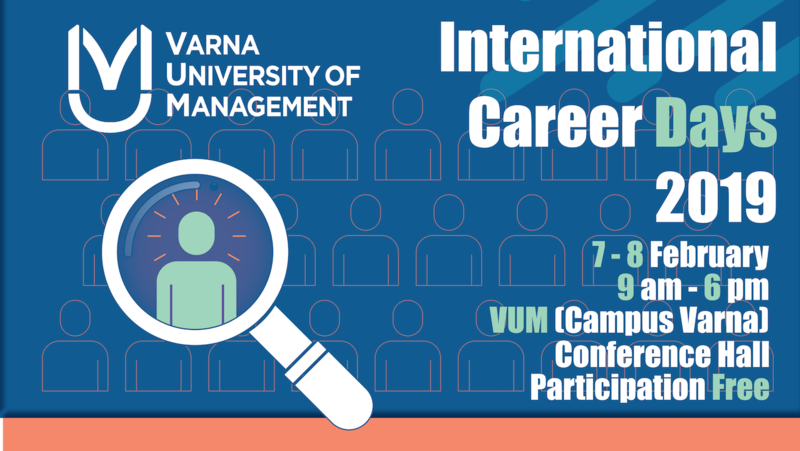 The annual International Career Days at Varna University of Management will be held on 7 and 8 February 2019 in our Varna campus. The purpose of the event is to offer various programs for internships and job opportunities for students, graduates and young people from Varna and the region. Employers from over 30 local and international companies operating in Bulgaria, Portugal, Spain, UK, Ireland, Sweden, Greece and others will take part in the initiative. The internship and job positions offered by them are in the fields of tourism and hospitality, business management, marketing, finance, operations outsourcing, information technologies, human resources, transport and logistics. Among the registered companies are Pine Cliffs (Marriott International), IPRACTICE COSTA BRAVA, Good Time Group OE, ATLANTICA HOTELS AND RESORTS, STP BULGARIA Ltd., International Hotel Casino & Tower Suites, Lighthouse Golf and Spa Hotel, Sitel, The Taxback Group, Miraggio Thermal Spa Resort, Immedis, Easy Consult. The first day of the event will allow the participating employers to present their business and opportunities for internships and job positions, as well as the requirements for the successful candidates. The second day of the event will be dedicated to direct contact between employers and future interns/employees, as well as for conducting interviews. The dates of the International Career Days are 7 and 8 February 2019, 9 a.m. to 6p.m., and the venue is the Conference Hall of Varna University of Management (Varna, 13A “Oborishte” str. fl. 4) The event is open for all motivated young people looking for successful career start or development. Participation is free of charge, however registration required. To register, please follow this link. Do not miss the opportunity to meet the people you would like to work with!